At a time when independent bookstores are going out of business all over America, the Gnu’s Room –it’s a pun—in Auburn, Alabama, makes a lot of sense. It is organized as a nonprofit bookstore, mainly used books, and as a local center for the arts: literary, visual, and performing. As part of its mission, the Gnu Arts has established a nonprofit imprint, Solomon and George Publishers, named in honor of Olivia Pienezza Solomon, short story writer and folklorist, and Anne Carroll George, poet and, perhaps more famously, the author of the highly successful mystery/cozies The Southern Sisters series. Ms. Solomon and Ms. George graduated from UA, but Solomon taught at Auburn, and the papers of both writers are now in the Auburn library. This anthology, the Solomon and George Publishers debut volume, is, appropriately, devoted to writings by people with an Auburn or east Alabama connection and all seem to be set in Auburn or, at least, not discernibly elsewhere. The featured story in this collection is “The Prophetess,” by Olivia Solomon, which combines fiction and folklore. The protagonist, Suzannah, even as a little girl, has “the gift.” She has second sight, can see the future, no matter how painful, but she will have to reconcile this with her Christian faith. There are also included a series of six poems by Anne George. Their quality reminds one that she was an honored, successful poet before she ever launched her cozies. The same insights and humor are very much present. There’ll be more missing than a finger. “I’ll tell you this, though, about his finger. The publishers enlisted as editor Bert Hitchcock, a recognized expert on Alabama literature, who has organized a hefty salmagundi, a veritable stew, of a book. In his Introduction, Hitchcock explains the title. Southern literature earlier in the twentieth century was often romantic, nostalgic for the antebellum life, the plantation with “moonlight, mockingbirds, and magnolias.” A friend reminded him that the South might more accurately be described as a place of “blinding, blistering heat, crows, and chinaberry trees.” From this piece of wisdom, Hitchcock formed his title. This book in fact contains little in the way of plantation stories and little in the way of Jim Crow or civil rights stories, but that material has been covered thoroughly elsewhere. It is of course a mixed bag, in every sense. 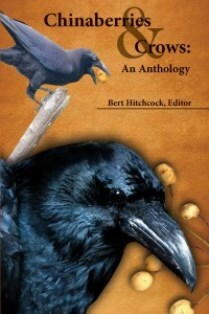 Hitchcock has included all genres: poetry, fiction, and nonfiction of all kinds, and that means ALL kinds. There are twenty-two poems, thirty-three pieces of assorted prose, and readers will surely like some better than others. To skip to the end, there are four eulogies of recently deceased writers, and one is grateful to have these tributes, originally presented orally, in print. Hitchcock includes Wayne Flynt’s moving personal talk at the funeral of Wayne Greenhaw, Hardy Jackson’s eulogy to his “cousin” Kathryn Tucker Windham, Rheta Grimsley Johnson’s tribute to Charles Rose, an Auburn fixture for many years, and the eulogy of Mary Belk for Madison Jones, considered by many to be one of Alabama’s finest novelists. Hitchcock has also included a chapter from A Cry of Absence, Jones’ best novel, and this is a good choice, which might perhaps draw readers back to Jones’ fiction. Of the many other stories here, the Oxford Stroud story, “Henry,” is a pleasure, a combination of Mark Twain cracker barrel humor and the Tall Tale. Henry might be a great liar, with his story of growing a championship watermelon using four wagonloads of dead ants for fertilizer, but who cares. Several of the stories, fiction and nonfiction, of growing up in Auburn are undeveloped and anecdotal, and the theme: “Once there was a golden age of innocence and harmless fun” seems overdone. More successful is “Orange and Blue and Read All Through,” an unusual piece by Lan Lipscomb who writes of an earlier Auburn using a copy of “The Orange and Blue,” the student paper of the Alabama Polytechnic Institute from March 27, 1901, that came into his possession. He comments on the news items, the “Brief Locals,” even the ads. These really capture the flavor of the old village. “I Can’t” by Charlene Redick is the sad story of a beautiful Auburn woman, Victoria, now a widow, who doesn’t summon up the courage to start a romance with an exotic man, highly literate, a Russian, Jewish consultant in nuclear engineering she meets in the Auburn library. He is just too different for her to take a chance. The best of the short stories may be “Wingflicks” by Marian Carcache, a story told by a bright daughter of her mother’s coming back to life through love for a handsome, wayfaring stranger.